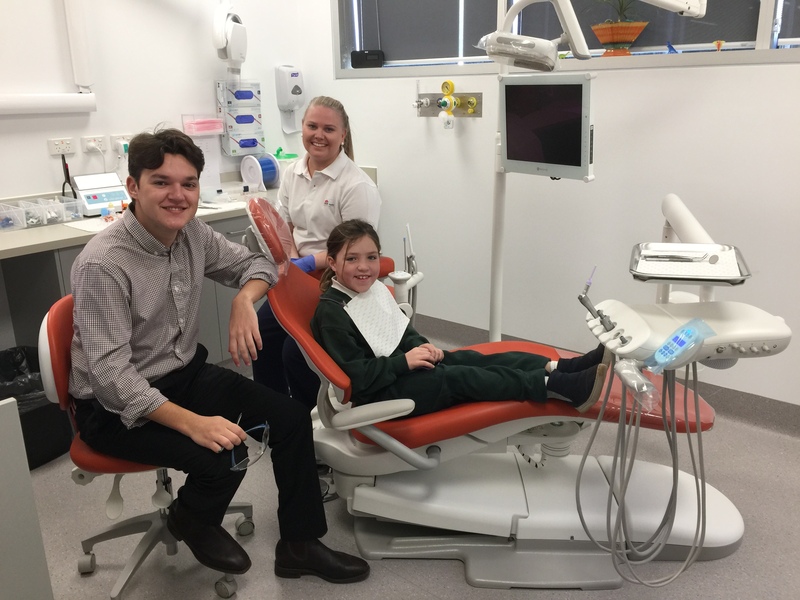 Far West LHD dental staff have settled into the new dental facility at the Broken Hill Community Health Centre in Sulphide Street and since opening on 2 July 2018 have been steadily providing a range of services for public patients. The centre’s first patient was seven year old Claudia Shoobridge, who was very excited when she was told that she was the first ever patient to use the new dental chair/facility. Claudia liked the new chair and child surgery and has since been back and used the services again. The first patient to the new Broken Hill Public Dental Clinic at Crystal St premises was Claudia Shoobridge (7 years old). She is pictured with Andrew Somerville (Oral Health Therapist) and Courtney Squire (Dental Assistant). Staff are enjoying the new facility, which includes a five-chair clinic with its own sterilisation facility and laboratory for provision of locally made dentures. There is also an Oral Health Education and Promotion section where adults and children are able to be taught hands-on tooth brushing and denture care skills. However, whilst the new Broken Hill Public Dental Clinic is operational Monday to Friday from 8.30am to 5pm, patients still need to make an appointment by calling the contact centre on 1300 552 626. “To assist in the smooth running of the service and the reduction of waitlists, the local service uses an Oral Health contact centre,” said Hollie Day, District Manager Oral Health Services, Far West LHD. “The contact centre ensures that all patients are triaged in the same manner so that patients are therefore seen on a priority basis. Patients cannot be appointed by presenting to the Crystal Street premises,” she said. Ms Day said the clinic has an Oral Health Therapist and Dental Officer working from the premises every day, providing free oral health services to all persons under the age of 18 years as well as dental services to eligible adult patients who hold a current pensioner concession or health care card. Ms Day said it is envisaged that the additional number of chairs within the facility will assist in fostering a Student Placement program for both Dental Officer and Bachelor of Oral Health students. “Having students come out to work from the new facility would benefit the dental clinic, the community and consumers of the service as well the Broken Hill community as a whole,” she said. Eligible adults and children can access the local oral health services by calling 1300 552 626. Adults need to quote their Centrelink concession card number (pensioner or health care card) when calling the contact centre and all patients need to quote their Medicare card number. All clients of the Community Health Centre are also reminded that parking is available and reserved for clients in Crystal Lane.